Start by brining the chicken. Dissolve the sugar and salt in the hot water, then mix1 litre/1¾ pint cold water into the brine solution. Submerge the chicken and leave to stand, covered, for 2 hours. Meanwhile, make the sauces. For the sweet soy sauce, put the soy, mirin, rice wine vinegar, ginger, garlic and sugar into a saucepan. Stir over a low heat until the sugar is dissolved and simmer for 2 minutes. Taste for seasoning and add a little salt if necessary. Add sesame oil to taste. Whisk the cornflour with a little cold water until you have a smooth but very runny paste, then whisk this into the sauce over a low heat, until the sauce thickens very slightly. Set aside. For the chilli sauce, whisk all the ingredients together, thinning with a little water if too thick. Taste and add salt if necessary. To cook the chicken, drain and rinse the brined chicken thoroughly, then pat dry. Make the first coating (this is the coating the batter will stick to, otherwise it tends to fall off) by whisking the flour, cornflour, baking powder and salt together. Dust the chicken in this mixture, patting off any excess, and leave to stand while you make the batter. For the batter, whisk together the dry ingredients, then whisk in 100ml/3½ cold water and the vodka – the texture should be quite thin, like double cream. Dip the chicken pieces in the batter one at a time. Allow any excess to drip off over the bowl, then slowly lower into the hot oil, letting go when the chicken piece is almost submerged. Fry for 8–10 minutes, then drain and put on kitchen paper – the chicken should be cooked through but have barely taken on any colour. Turn the heat up to 190C, or if using a saucepan, turn the heat up and leave for around 5 minutes to reach the right temperature. Fry the chicken for another 2 minutes, or until it has darkened. Remove and drain thoroughly on kitchen paper. It should be beautifully crisp. 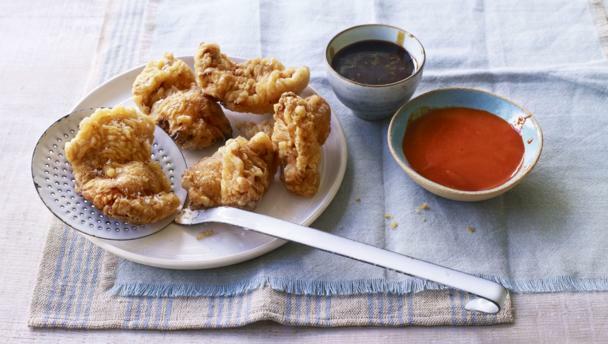 You can serve it with the sauces, or you can brush some of the soy-based sauce over it and serve with the chilli sauce.